Lukviarman, Niki and Prima Johan, Arief 2018. Meta-analysis of corporate governance in Asia. Investment Management and Financial Innovations, Vol. 15, Issue. 2, p. 267. 2014. Surrendering to the Big Picture: Historical and Legal Perspectives on Accountability in the Democratic Republic of Congo Following the Defeat of the March 23 Movement. Stability: International Journal of Security & Development, Vol. 3, Issue. 1, p. 7. Bachmann, Sascha-Dominik 2012. Bankrupting Terrorism: The Role of US Anti-terrorism Litigation in the Prevention of Terrorism and Other Hybrid Threats: A Legal Assessment and Outlook. Liverpool Law Review, Vol. 33, Issue. 2, p. 91. 1 This essay does not deal with the rise in the use of private military and security companies as combatants in internal conflicts. 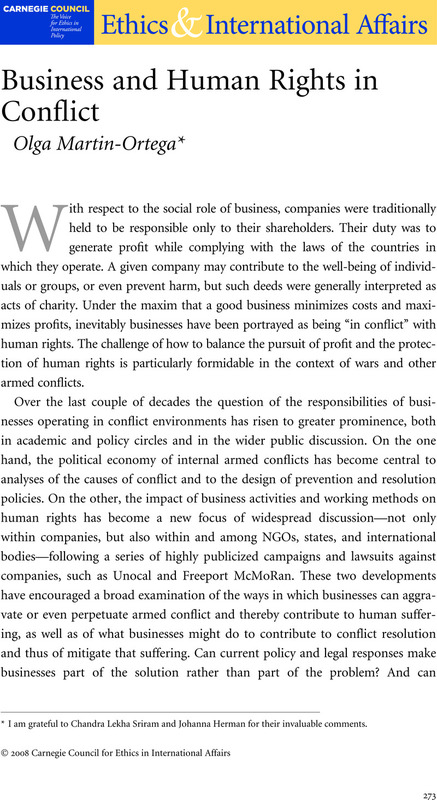 These companies are not only operating within war zones, but their business is war; therefore their case demands a specialized and dedicated debate as well as an urgent policy response. For a similar reason I have preferred not to include arms producers and traders in this analysis. 2 William Reno adopted this term in the early 1990s; see in particular William Reno, Warlord Politics and African States(Boulder, Colo.: Lynne Rienner, 1999). 3 Doe v. Unocal Corp., 395 F 3d 93d (9th Cir. 2002). 4 The case against Coca-Cola, Sinaltrainal v. Coca Cola Co., 256 F. Supp. 2d 1345, 1358-59 (S.D. Fla. 2003), was dismissed in 2006 and is awaiting appeal. 5 For the cases against Drummond, see Romero v. Drummond Company, Inc., 430 F.3d 1234, 1243 (11 Cir. 2007); and Estate of Rodriguez v. Drummond, 256 F Supp 2d 1250, 1257 (N.D. Ala. 2003). 6 In the case of Chiquita, three lawsuits were filed in 2007 in Colombia and the District Courts of Florida and New York. In 2008 they were consolidated to be filed only in New York; see In re: Chiquita Brands International, Inc., Alien Tort Statute and Shareholders Derivative Litigation, Transfer Order, Feb. 20, 2008. 7 Bowoto v. Chevron Corp., 557 F Supp 2d 108c (N. D. Cal. 2008); Wiwa v. Royal Dutch Petroleum Co., 226 F 3d 88 (2nd Cir. 2000). 8 Baenal v. Freeport McMoRan, Inc., 197 F 3d 161 (5th Cir. 1999). 9 In his Interim Report, John Ruggie expressed the view that the norms did more harm than good, maintaining that “the Norms exercise became engulfed by its own doctrinal excess” and that “its exaggerated legal claims and conceptual ambiguities created confusion and doubt”; UN Doc. E/CN.4/2006/97, February 22, 2006, para. 60. * I am grateful to Chandra Lekha Sriram and Johanna Herman for their invaluable comments.